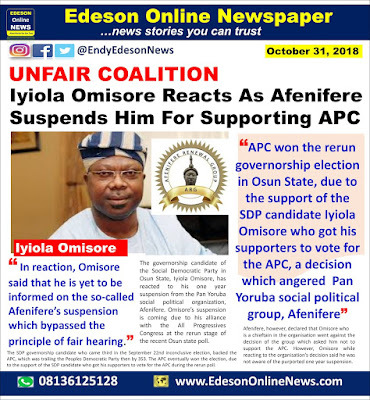 The governorship candidate of the Social Democratic Party in Osun State, Iyiola Omisore, has reacted to his one year suspension from the Pan Yoruba social political organization, Afenifere. 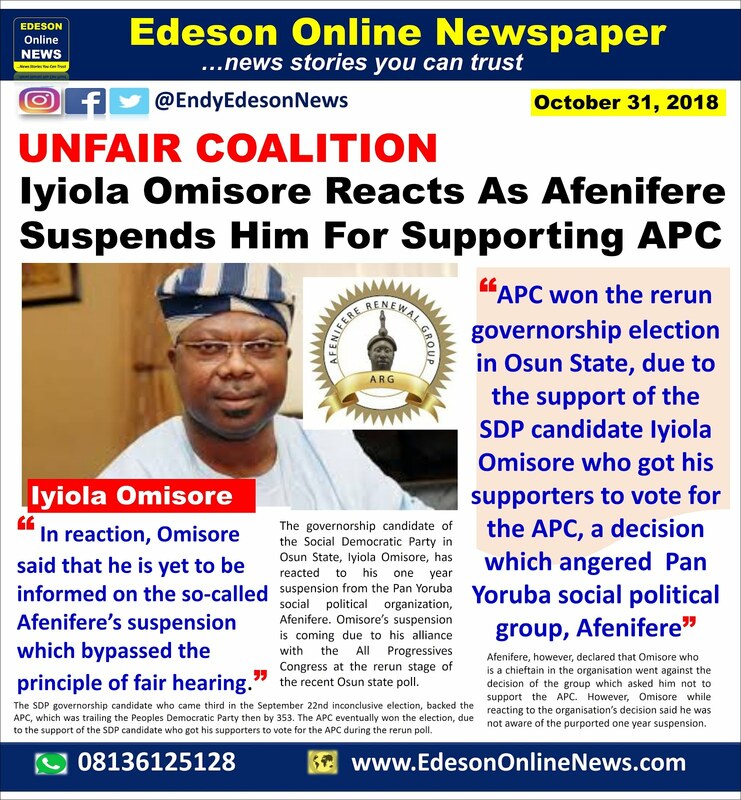 Omisore’s suspension is coming due to his alliance with the All Progressives Congress at the rerun stage of the recent Osun state poll. The SDP governorship candidate who came third in the September 22nd inconclusive election, backed the APC, which was trailing the Peoples Democratic Party then by 353. The APC eventually won the election, due to the support of the SDP candidate who got his supporters to vote for the APC during the rerun poll. of the group which asked him not to support the APC. SO AFENIFERE IS A PDP social political group? AHILE: I don't think so. Maybe, the group wants to remain neutral. Omisore deviated from the warnings of Afenifere regarding the election. @Agba: Thanks. That's why they are angry with Omisore for being One Sided. Endy, you are right. Afenifere is politically neutral. The stark illiterates who are quick to accuse AFENIFERE of flirting with PDP cannot even read the reaction of Omisore. He said: " we also have bonafide, notable and active APC members in AFENIFERE . I know the common denominator to all of them is RESTRUCTURING.